I have a few stories I want to recommend, but some really good stories tend to get taken advantage of. One, I'd like to recommend, I won't do so without the writer's explicit permission since they had a recent problem. In other news I do have a very funny, very good story for you! Do you want to laugh? 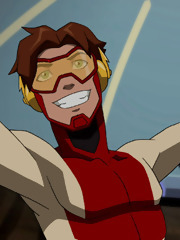 Do you like Bart Allen and Roy/Arsenal? Do you prefer a collection of one shots, compared to an unfinished multi-chapter story? I've got the perfect story! Chapter 2 and Chapter 11 have to be my favorite ones; although they are all a good laugh! If you decided to read this story, if you decided to review this story please post ' IAO#fangirling ' in your review to show My Blog sent you! Thanks!